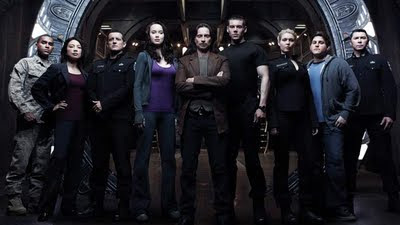 Stargate Universe, the third incarnation of the successful Stargate series, premiered to high ratings and rave reviews in October. Ming-Na (pictured, second from left) — who got her start in the biz by playing Lien Hughes on the daytime soap opera As the World Turns, then followed with starring roles in The Joy Luck Club and Mulan, and rounded out her resume with ER — co-stars on the outer-space adventure series playing the role of Camile Wray. For those unfamiliar with Stargate, this particular series focuses on a group of soldiers, scientists and civilians who, while fleeing an attack, travel through a stargate and find themselves stranded far from Earth on a mammoth spaceship known as the Destiny. 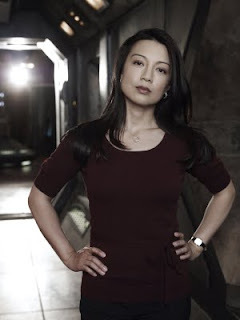 Ming-Na is no stranger to science fiction. In fact, she has been a fangirl for much of her life. “I have been a sci-fi fan since I was very young,” she says. “I was president of the science-fiction club when I was in high school. It’s such a great genre. According to Ming-Na, her character, Camile, is a very complex character, which was a big reason she wanted to play her. “She starts off being someone you think is very by the book. As you get to know her, you feel like there is such a vulnerable side to her. She masks it with her ambition and her drive to prove something. Another great working experience for Ming-Na was the time she spent in the early ’90s on ATWT. She reveals: “I loved working on ATWT. That was so much fun and such a great experience. Prior to that, I was theater trained, so that was my first camera training, and I learned a lot from that. You can catch Ming-Na on Stargate Universe on Friday nights at 9/8 CST on the SyFy channel. You can also catch up on episodes (if you have missed any) on syfy.com.